All too often, business openings or reopenings are delayed as a result of interruptions in construction or renovations. As a business owner, this can cause many hardships, such as lost revenue, lost profits and in many cases, additional costs and expenses to get the project done. As a land development lawyer in Delaware County, I have often handled cases such as this. 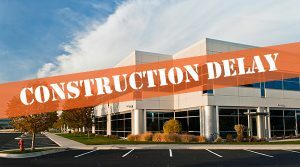 Recently, a client could not open its doors because the general contractor defaulted on the substantial completion date. The contractor’s lack of management of the construction schedule resulted in subcontractors’ inability to collaborate and complete their respective work on time. The unfortunate alteration of the construction schedule occurred almost immediately upon mobilization of the project, and in an effort to right the project, the client and its design team endeavored to control the construction schedule before contacting our office. In the end, the client spent a significant amount of money trying to resolve the issues and complete the project. Engage your real estate development attorney immediately and make sure you have a copy of your construction agreement and all other relevant construction documents. If you have an architect or project manager, get them involved and see if they can assist in determining the delay issues and keep the project on schedule; however, do not take on the task of trying to control the construction schedule or proposing changes thereto, as that could result in you buying into future liability. In the meantime, our office will review the default notice and termination provision of your contract, in addition to reviewing the agreement for possible liquidated damages, mandatory mediation/arbitration clauses and any disclaimer provisions. If, after speaking with your design team, we find the contractor is in default, we will issue a notice of default pursuant to the contract documents to protect you, while assisting in the effort to move the project toward completion without the need for litigation. The bottom line is, do not try to drag the project to the finish line on your own. If you anticipate a possible default of the substantial completion deadline because of a general contractor’s inability to manage the construction schedule and complete the work, get your real estate development counsel involved early. It will save you costs, in the long run.